Mexico is an easy-to-reach paradise that ranks high on many scuba diver’s wish lists. Between the Atlantic, the Pacific, the Caribbean and a freshwater cave system, it holds thousands of dive sites to explore, including everything from shark encounters to pristine reefs and manta cleaning stations. When planning your dive vacation in Mexico keep in mind that there’s a little something for everyone, but all together these are the top ten dive sites and dive experiences in Mexico. The employees of the EPA do more than regulate the emissions in your car–some of them take direct measures toward protecting the health of American waterways. 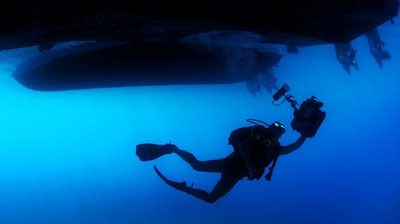 Since the agency’s inception in 1970, the Environmental Protection Agency has maintained a scientific diving program. The first diving teams were based in Seattle and Gulf Breeze, Florida, to support EPA research, environmental monitoring and emergency response efforts. 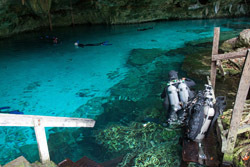 Looking for a way to take your SCUBA diving to the next level? 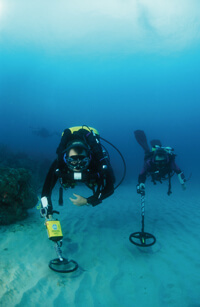 Many divers are exploring the exciting hobby of underwater metal detecting. Underwater metal detecting and SCUBA diving are a pretty great pair. While you’re out diving and looking at all the amazing undersea life, your hands are basically free. Taking a metal detector along allows you to add another element to your dive that could even help you find sunken treasure! I recently received an anti-fog product sample called Sven Can See (I do not know who Sven is). The product is intended for more uses than just diving, but obviously that will be my focus here. Why Does a Mask Fog? The crystal clear water feels warm on a beautiful sunny day. You look around at the stunning island scenery before you slowly descend below the calm surface. Excitement grows as you anticipate the vivid colors and active sealife. Suddenly, your mask fogs up. Uh-oh. "Did I rub on the drops?" "Did I spit with enough phlegm?" "Maybe I rinsed twice instead of once?" "Did I rinse too aggressively?" How Do You Clear a Scuba Mask? After breathing, there is perhaps no skill more fundamental than mask clearing. While other skills, such as gear assembly, are a requisite part of getting in the water, they technically could be done by someone else (although this is not recommended). Mask clearing, however, is a solo skill, and the inabiility to perform it will easily ruin a dive. The level of experience you quickly achieve moving through the professional ranks comes along with a level of comfort in the water. This level comes much quicker than just through regular diving.